This post is the third in a series looking at the budget cycle and how civil society can most effectively engage at each stage of it. The previous post in this series addressed how civil society can influence the budget enactment phase, in which the Executive’s Budget Proposal is submitted to the legislature for debate, alterations, and approval of the final budget. This post will focus on the third stage of the budget cycle: the budget execution stage. What happens at the budget execution stage? Put simply, the budget execution stage is when funds are actually raised and spent to implement the policies, programs, and projects outlined in the enacted budget. This stage can be somewhat of a challenge for civil society groups looking to ensure the budget is implemented as intended, as they typically have limited options for engagement. Governments differ widely in how they regulate and monitor spending to ensure adherence to budgets. In some cases, the treasury (or finance ministry) exercises strong central control over spending. In cases where departments have more autonomy over managing their budgets, treasuries monitor expenditures through such requirements as regular reporting by each department of its spending. In practice, budgets generally are not implemented exactly as they were approved; in many cases funding levels in the budget are not adhered to and, through such practices as virement (i.e., the executive shifts funds that were allocated to one area to another during the budget year), authorized funds are not spent for the intended purposes. Deviations can result from conscious policy decisions or in reaction to changing economic conditions, but concerns arise when there are dramatic differences between the allocated budget and actual spending that do not correlate with any measurable policy. Sometimes these cases result from outright abuse by the executive, but they may also reflect the effects of a poor budget process and technical problems that make it difficult for the executive to implement the budget in line with what was enacted into law. For instance, the budget may not be clear about the intended purposes of particular funds, and weak monitoring and reporting systems can limit the availability of information that the executive needs to monitor the flow of expenditures. Budget execution is an executive function. Unless the executive issues public reports regularly on the status of revenues and expenditures during the year, civil society organizations (CSOs) have limited ability to monitor the flow of funds. However, CSOs have a strong interest in ensuring adherence to the budget and reducing mismanagement or corruption, which requires there to be an effective and transparent monitoring system. When such a system is not in place or not functioning well, these groups must bridge the gap. Using In-Year Reports and the Mid-Year Review, which communicate at regular points during the budget year actual spending figures versus budget allocations, CSOs can monitor whether funds allocated to specific projects, such as a school or a road, have actually been used for the intended purpose. Using the information provided by the government, and that they gathered through monitoring spending on the ground, CSOs can also assess the quality of the spending to see if the policy goals associated with the budget allocation are being met, and if government funds are being used effectively. In order for CSOs to make a greater contribution to oversight of budget execution, they need the skills to analyze the data and present their findings, including those on who is benefitting from public spending compared to those who were supposed to benefit and those related to mismanagement at the point of service, as well as the relationships and opportunities to engage in formal oversight processes and with formal oversight institutions (i.e., the legislature and supreme audit institution). An example of effective civil society engagement in the budget execution stage comes from IBP partner the National Coalition on Dalit Human Rights (NCDHR) in India. As part of its Campaign for Adivasi and Dalit Right to Education (CADRE), NCDHR successfully involved student groups and faculty across 30 universities in 15 states to use government data on scholarship allocations and actual expenditures to monitor and follow up on fellowship awards for dalit and adivasi students, who have long suffered from deep institutional and societal discrimination. The CADRE campaign organized a student tribunal at the national level at which it presented over 200 documented cases of scholarships being denied to dalits and adivasis. 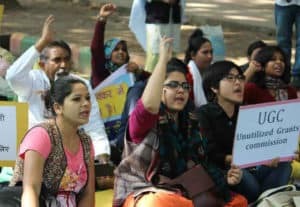 (The CADRE campaign had already moved 14 members of the national parliament to raise questions on government spending on scholarships for dalit and adivasi students.) At the tribunal, it was revealed that the Ministry of Social Justice and Empowerment and the Ministry of Tribal Affairs, the two nodal ministries for scholarships for dalit and adivasis, had outstanding transfers to state governments amounting to Rs98 billion (US$1.5 billion). As a result of the CADRE campaign’s monitoring and engagement in oversight, Rs65 billion (US$1 billion) has now been released. NCDHR is closely monitoring the pending releases for the scholarships, and will be continue to monitor how the resources released are spent. While the governmental and civil society context is different in every country, and even among different sectors and localities within each country, CSOs can develop strategies to engage with their governments and make their voices heard. Governments should be mindful of the positive impact that citizen and civil society engagement can have on budget execution, and throughout the budget cycle, and provide access to comprehensive and timely execution data and to opportunities to participate in execution on the ground, in order to ensure that resources are used equitably and for their intended purpose.